When you’re a patient at Cardinale Dentistry, you’re treated with the same professionalism, compassion, and empathy we offer our family members. Dr. Cardinale, Dr. Moody, and our team members are committed to delivering high-quality care in a welcoming and safe environment. You will always be heard, respected, and encouraged to be an engaged partner in achieving your healthiest smile! What’s Different at Cardinale Dentistry? 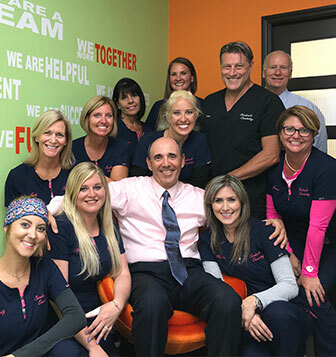 We’re an established practice, having served the Naples area since 2001. You’ll have continuity of care and see the same friendly faces at each visit. We believe the best dentistry, and happiest, healthiest smiles, are a result of a partnership between you, our doctors, and our team. Working together, we’ll find the ideal treatment approach for your needs and goals, and ensure you’re informed, educated, and supported as you take control of your oral health and smile. We respect your unique situation and offer dental solutions that work for your clinical concerns and personal desires. Every treatment, each procedure, and all visits are tailored specifically to you. We combine leading-edge technology with proven techniques, for the best care experience and strongest results. We want you to feel like you’re part of our professional family and for each visit to be a positive, informative experience. If there is ever anything you need, please let us know. We are here to serve and help you! Our passionate vision is to establish positive relationships that make our patients happy and enthusiastic to be part of our caring family. We are true professionals, working in an energetic and fun office. We carry the responsibility of ideal personalized care, entrusted to us by our patients, with dignity and pride. Our patients want and value superior service: They appreciate how much we give of ourselves. They partner with us to invest in their dental health and become ambassadors who spread the word of our office excellence. We touch the lives of our patients and our rewards are the smiles we share. Simply stated, we are happy and like to make others happy. Please contact our Naples, FL general and cosmetic dental office and schedule a visit. We serve Bonita Springs, Marco Island, and all surrounding communities, and look forward to serving you. Together, we’ll ensure you achieve the radiant, healthy smile you desire!